We are pleased and proud to announce the launch of our new Gold Club. At Avonvale, we understand the special relationship people have with their pets and we aim to provide the best possible health care in a friendly and welcoming environment. 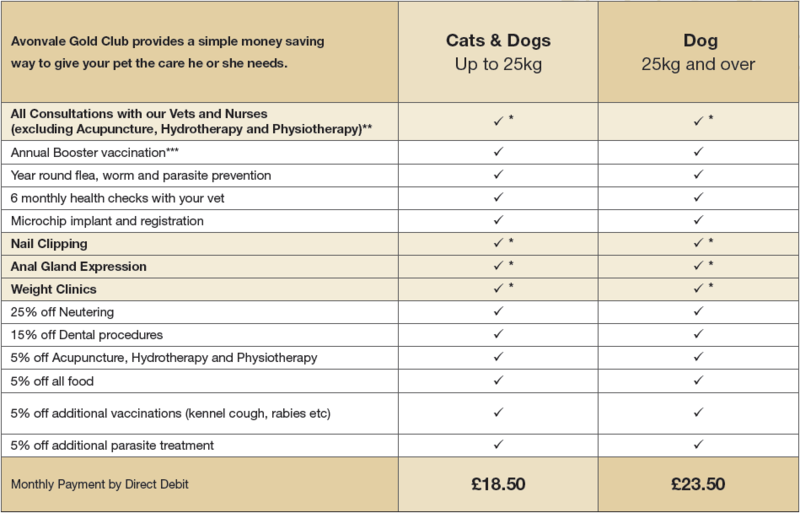 The Gold Club is a convenient and affordable way to spread the cost of your pet’s visits to the practice along with covering their vaccinations, flea, worm and parasite treatments. There are also great discounts and savings on many products and services that all help to ensure your pet receives the very best healthcare. It includes all of your pets consultation fees (excluding acupuncture, hydrotherapy and physiotherapy) as well as their annual boosters and flea and worm treatments. We believe a proactive preventative approach to your pet’s health is far better than waiting until he or she is ill or suffering to put things right. Regular health checks and early diagnosis of potential health issues may help your pet enjoy a long and comfortable life. We have teamed up with Animal Healthcare Company who administer our Pet Club plans and collect your direct debits on our behalf. This leaves us free to concentrate on looking after your pets. Joining one of our Pet Clubs is easy. Call into our surgeries with your bank details and complete a direct debit form. You can also sign up at the time of any appointment or vaccination. Pay your first month’s fee and complete a simple direct debit application form to authorise a further 11 monthly payments of the same amount each month. Your first direct debit payment will be requested 14 days after joining and monthly thereafter. If you cancel your policy at any time other than at your plan anniversary you will be required to pay Avonvale the outstanding amount for the products and services you have received. In the unfortunate event that your pet passes away or goes missing please inform us immediately. Avonvale Gold Club is not a pet insurance policy. It spreads the cost of routine preventive pet care at the recommended annual doses, which is not covered in standard pet insurance policies, although all consultations are included, it does not cover the costs of all veterinary care so we recommend taking out separate pet insurance for this.